This month's quiz- You're lost in the desert, and come to a fork in the road. Which way should you go?Scroll down for the answer! 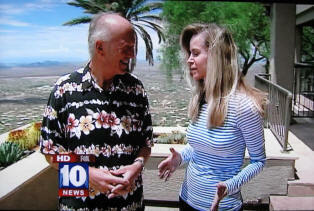 Fox10's Cool House features a Carefree Home This property is the highest available view property! 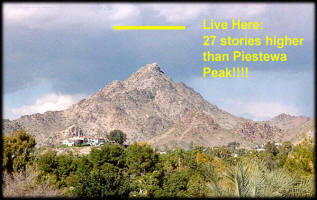 (Cave Creek-PW) Imagine living in a home that is actually 27 stories higher than the summit of Piestewa Peak in downtown Phoenix? That's a good analogy to describe how high homes on Carefree's Black Mountain. (photos below) Piestewa Peak, with about where this house would be located, and the view from the home! Diane Ryan, Fox10's veteran reporter and home expert, traveled through the two security gates to showcase this home recently, listed for $ 3.49 million, complete with 13 acres. The residence has an interesting story. The original owner of the home was a top CEO for a major US electrical company. He owned large portions of land on the slopes of Black Mountain, and found a promontory above the old site of the Mormon Girl mine that afforded unobstructed views to the East and West, and direct panoramas of the night lights of Phoenix. This is where he constructed his home. This Black Mountain home is so high that some of the listing photographs for the MLS were even taken by airplane! (photo below) Host Diane Ryan talks with Preston Westmoreland on the balcony of this view home for the "Cool House" edition. Thanks for reading our blog! Check out our Summer Issue for the latest news and special events for our visitors! Who is this guy writing this blog? The award-winning design of the Carefree Fire Station, with large sloping roofline. Always great to see. Carefree (PW)- Oh my, it happened again. A buyer called me the other day, trying to get the price of a home down, and said the "unthinkable." I had to clean my ears out! I thought I had heard the last of it. "Preston," he said," they are now predicting Phoenix real estate might fall 8.5% in 2013." I thought I had him convinced that the bottom was reached last October. Some experts say August, and Zillow and everybody else says Phoenix is rocketing out of the housing doldrums quicker than any home in the nation. I told my Doubting Thomas client that housing experts are like a broken watch, and that's right twice a day. I then jokingly said "I supposed you believe there's a shadow inventory also, that the banks are withholding thousands of homes off the market, ready to collapse it?" He looked at me curiously and spit out "that too." If all the signposts are correct, we should be heading for a wonderful recovery in the Arizona Real Estate Market, but some buyers just didn't get the news. I can't count on both hands, the number of anxious buyers I took around as real estate plunged in price year after year, who then sat back and did nothing as we slammed into the bottom and then started taking off again in price. Everyone of them is without a home and just can't figure out what's going on. These are our shadow buyers, always forever lurking. . . and looking. . . and wanting. . .. We wish them well! See you on the next cycle. It's listed for around $525,000. Call 602-377-0060 for further info. Sign of the Times-which signs should Carefree use? Then, many of the sandstone monoliths were removed and replaced by heavy metal rusted iron signs in the shape of Carefree's main attraction, the Sundial. These signs remain. But wait...before long, in an attempt to help draw buyers to specific stores, came the "P.T. Barnum" circus signs, so-called because of their bright colors, and ever-changing placards with restaurants and store names on them. Often the brunt of jokes in the local newspaper, many claimed the garish signs not only didn't fit the Carefree image, but were distracting when placed by the traffic circles. At least now, even in the summer, there are some cooler places to enjoy in the award-winning Carefree Cactus Gardens! Phoenix topped real-estate portal and online valuation service Zillow's list of metro areas expected to achieve growth in home values in 2013 in a report issued in April. According to Zillow, the Phoenix area is expected to experience a 6.5 percent increase in median home price in 2013 compared with the current year. The first runner-up was Miami-Fort Lauderdale with an expected median-price increase of 5.6 percent, followed by Tampa with an expected 2.5 percent increase. According to Zillow, the predictions are based on data from past home-value trends and current market conditions, including leading indicators such as home sales, monthly housing-inventory supply and jobless rate. An Arizona State University report issued Thursday said the Phoenix area's median single-family-home price was up more than 20 percent in March compared with a year earlier. The number of foreclosures completed in March was down a whopping 60 percent from March 2011, according to ASU real-estate analyst Mike Orr, who wrote the report. Orr said new-home sales were up 35 percent in the Phoenix area for the same time period. Of the 30 major metropolitan areas included in the Zillow forecast, 16 markets were expected to see median home-price increases, while 14 markets were expected to see price declines in 2013. At the bottom of the list was Atlanta with an expected decrease of 4.1 percent, followed by Chicago with an expected 3.8 percent decrease. Answer to this month's quiz- If you are lost and come to a fork in the road, which direction should you go? Preston Westmoreland, your stern-appearing resident blogger, was recently on TV from Piestewa Peak Park, and put Fox10 News anchors Rick and Andrea to the test, and they both flunked, by saying "go to the right." The recommended direction is to turn around and go back the other way. When you go deeper into the wilderness, roads or trails frequently divide. They never get better, they always get worse. Think of the Mississippi River, with tributaries splitting smaller and smaller. The river flows the way out. This trick works best in rough terrain and not on open flat desert. By the way, Preston appeared as desert searchers were looking for a lost hiker. The body of Kenny Clark was found 4 days later, one mile from the trailhead. Searchers had combed 267 square miles of wilderness for four days.